Medicine balls are usually sold as 2–25 lb (1–11 kg) balls and are used effectively in plyometric weight training to increase explosive power in athletes in all sports. Some medicine balls are up to 14″ wide and up to 14 lbs weight, or in the form of weighted basketballs. 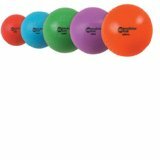 Modern exercise balls are larger, up to 36″ diameter.